Cast Iron is the most common and economical material for flat wire belt sprockets, they are accurately cast from high grade iron. Other diameters can be provided on special order. All plastic sprockets are fully machined and meet USDA and FDA guidelines for food contact. - High Temp UHMW Polyethylene can withstand continuous temperatures up to 220 degrees F.
- Nylon sprockets provide 2-3 times the strength of UHMW and can withstand higher temperatures. - FL sprockets have no flange and a hub sticking out one side to allow debris to fall through the belt. on the C Scale. All other steel sprockets can have their teeth hardened on request. 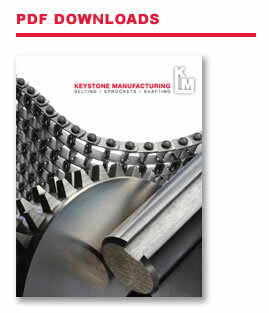 Stainless sprockets are either investment cast from 18-8 stainless or fully machined from T-303 SS or T-316 SS. Fully machined flangeless (-FL) or machined tooth (-MT) sprockets made from various stainless steels are also available.